« Disney’s Skinny Minnie Mouse & Daisy Duck on a Crash Diet? I had a revelation today. I really don’t like Greek yogurt. I want to like it. I keep buying it by the tub at Costco. But I really don’t like it. I have tried adding a little vanilla and Splenda. Nothing works. I think I think I should like it…and I eat it because it’s “good for me”…and because, with some fruit added, it’s a “healthy” lunch. I can prepare and eat it quickly, between clients, when my schedule is packed. Where is it written that I have to eat Greek yogurt..or any other food just because it is “good” for me? Who says? Today, I am an “intuitive eater”. That means I pay attention to what I like and don’t like to eat, what leaves me feeling satisfied and unsatisfied, what feels good in my body vs. what leaves me with a queasy or overfull stomach and an icky after taste in my mouth. I am in touch with what foods leave me with a sharp, clear mind vs. those that leave me feeling fuzzy and desperate for a nap. Sorry, but Greek yogurt just doesn’t do it for me…and that’s OK! So, today I will throw away my very last half-eaten tub of plain Greek yogurt! Done! Do you have any healthy “food rules” that set you up for trouble? If so, why do you think you keep following those rules? And whose rules are those anyway? Oh I like this blog. How true, there are so many foods available, that are good for us and are enjoyable to eat so why do we force the other on ourselves. It’s one thing if that is all there is or no money left etc., but that is usually not the case. It is good to reexamine the food rules we have created in our heads and rewrite them. Thanks for sharing. I’m so happy you like my blog! I like it, too :-)! I just tried greek yogurt for the first time. Taste kinda like chalk. I won’t buy it again as it is even more expensive than regular yogurt. In my opinion. As Ellen stated, I have tried greek yogurt several times several ways; I just don’t like the taste of greek yogurt! 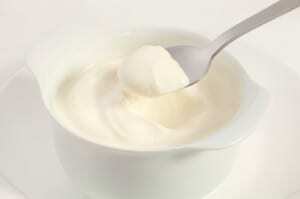 I LOVE yogurt (creamy low-fat) just not greek. Most store now-a-days seem all they have is Greek, greek, greek, even when web search! As I am witnessing on this page, not everybody do Greek yogurt. where can I find good creamy real fruity low fat yogurt, or how to home make it? I hate Greek Yogurt, I like fruity yogurt with real sugar, not sucralose. I eat half a little container added to real fruit like berries or bannana. By eating half with fruit I am satisfied.